Never mind the challenge an ice storm presents to humans; think what wildlife face. These few frozen winter apples will help the doe wait for a thaw. 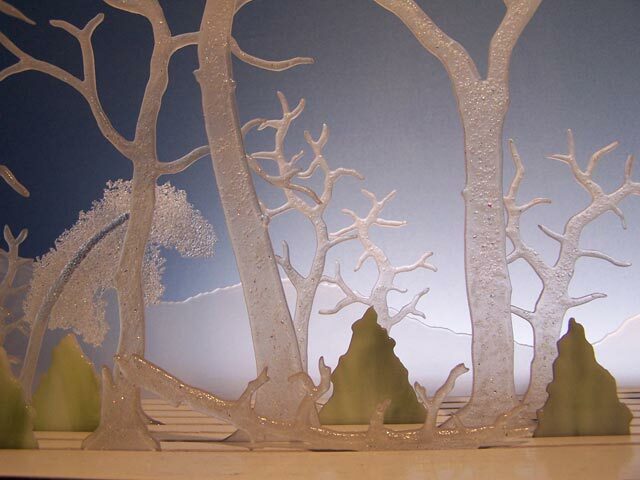 Made of clear and dichroic frit—crushed art glass—fused onto exquisitely cut, sandblasted clear glass, this forest landscape captures and holds the glitter of an ice storm that usually would last only a few hours. The sculpture is illuminated either day or night by a light, recessed into the rear of the hardwood base, which is reflected off the wall behind. Limited edition of 25. Dimensions: 42" long by 8" deep by 9" high.